When Graham Hill's private plane crashed on to Arkley Golf Course on a foggy night in November 1975, a nation lost an institution, the character who epitomized motor racing to the man in the street.As Hill had taken off from Marseilles the future held great promise; to the intense relief of his friends, he had finally hung up his helmet after a record 176 Grands Prix starts, 14 victories, and two World Championships. He was the only man ever to have won the Triple Crown: the World Championship, the Indianapolis 500 and the Le Mans 24 Hour race.He had set up his own F1 team, Embassy Hill Racing, in 1973 and since his retirement was molding it around the prodigious talent of upcoming Tony Brise, who had just been testing their new car at the Paul Ricard circuit in the south of France. Now all that remained for Hill's wife Bette, son Damon and daughters Brigitte and Samantha, were memories and a wealth of insurance claims from the families of team members, Brise among them, who had perished with him.Norman Graham Hill did not start driving until he was 24 years old, but his determination and good humor opened doors. He talked his way into a drive with the emergent Lotus team after hitching a ride back from Brands Hatch with founder Colin Chapman and Mike Costin. Each assumed he was a friend of the other; in truth, Hill knew neither of them. He was an opportunist, who usually succeeded once he had set his mind on something. Working as a mechanic, he charmed his way into drives in Cooper and Lotus sportscars in the late Fifties, and when Chapman went F1 with Lotus in 1958 Hill was one of his drivers. By 1962 he was ready for the World Championship with BRM. Six years later, with Jim Clark dead, Hill approached his 40th birthday by carrying the shattered Lotus team through its darkest days, and that year he won his second title against strong opposition from his former teammate, Jackie Stewart.A year later his career almost ended when he smashed both legs after being thrown from his Lotus 49B after tire failure during the American Grand Prix at Watkins Glen, but he stunned doctors with the speed of his recovery and won a Championship point on his return in the South African Grand Prix at Kyalami in 1970. 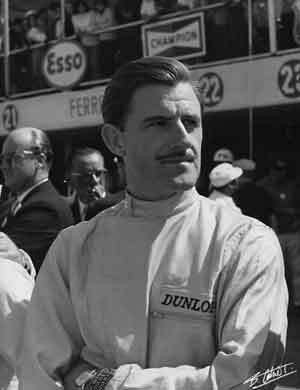 His son Damon inherited the family trait of raising his game in deepest adversity.With his flowing locks and Errol Flynn mustache, Graham Hill was the life and soul of any party. A man who was always active, full of boundless energy, he was capable of exchanging jokes with the best comedians and appeared on television with the British comic duo Eric Morecambe and Ernie Wise. When he died, even people who had never met him wept.